Background: Species of Valeriana show sedative, hypnotic, anxiolytic, antidepressant and anti-inflammatory properties, which are associated with valepotriates. However, data about toxicity and safety of these compounds are still limited. The aim of this study was to investigate the toxicity of a valepotriate-enriched fraction (VAL) from Valeriana glechomifolia Meyer based on the Organization for Economic Cooperation and Development (OECD) guidelines 423 and 407. Methods: In the acute study, CF1 mice were treated with a single dose of VAL (2000 mg/kg, p.o.) and observed for 14 days. In the repeated dose study, CF1 mice received single daily doses of VAL (30, 150 or 300 mg/kg, p.o.) or vehicle for 28 days. These doses were chosen based on previous results by our group and according to Guideline 407- OECD. Results: The acute study allowed to classify VAL in the hazard category 5. The repeat-dose study has shown that VAL 300 mg/kg delayed weight gain and reduced food consumption in the first week, probably due to transient sedative effects. The other doses had no effect on animals’ ponderal evolution. At the end of the treatment, all groups had equal body weight and food consumption. None of the doses altered any behavioral, urinary, biochemical, hematological, anatomic or histological parameters. 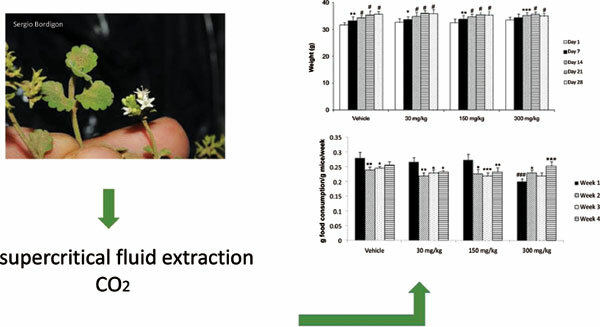 Conclusion: A valepotriate-enriched fraction from Valeriana glechomifolia presents relatively low oral acute toxicity and does not induce evident toxicity after oral repeated treatment (at least up to 300 mg/kg) in mice. Valeriana glechomifolia, Valerianaceae, acute oral toxicity, repeated dose toxicity, species, natural products.